sunflower writing table. unique writing table. custom furniture. The Sunflower Writing Table design was influenced by an antique table found in a museum in London. It is an example of the Aesthetic style of furniture which uses designs and decoration inspired by Japanese sources. The sunflower motif is also significant in Greek Mythology. Apollo was the son of Zeus, the king of all Gods and Men. Apollo was the Sun God. He had golden hair and was extremely handsome. A water nymph called Clytie was immensely in love with Apollo. She would watch him with unblinking eyes as he moved across the sky. Unfortunately, Apollo ignored Clytie and never returned her love. Apollo was in love with Daphne, the beautiful daughter of a water God. Unfortunately for Apollo, Daphne did not return his love. When Apollo tried to forcefully convince Daphne, she asked her father for help who turned her into a plant. Apollo was heartbroken and his sorrow knew no bounds. Clytie continued to watch Apollo as he passed through the sky. She sat on a rock for nine days without food and water and just kept looking at Apollo as he passed in the sky. Eventually, she was turned into a flower, which came to be known as the Sunflower. 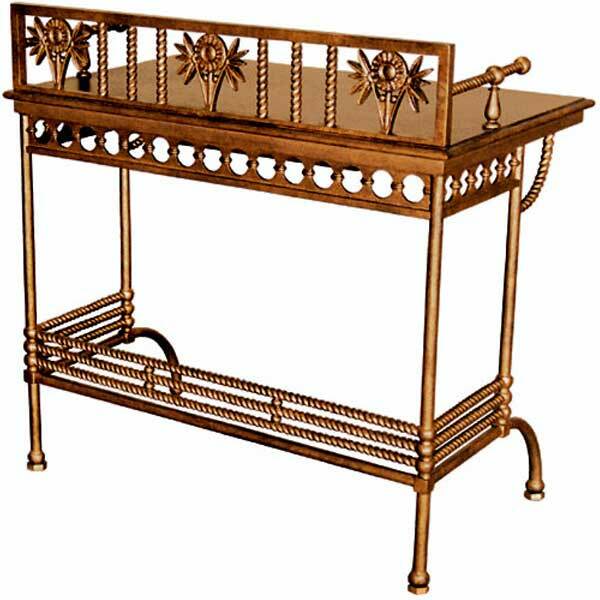 The foregoing inspired the award-winning designer Shah Gilani, ASFD, to make this metal and wood writing table. It is offered in a variety of finishes and accents. Four polished bronze glides are provided which also serve as levelers – a useful feature to have when the floor is uneven. Custom sizing is available.